Students Interpret Function Expressions to solve a riddle, which acts as a key and helps students check for accuracy. NOTE: Half of the expressions are inverse functions, so this is a relatively challenging activity. 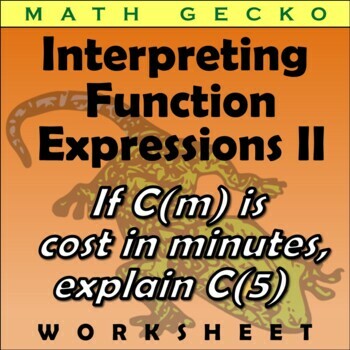 This worksheet requires students to think more deeply about the meaning of functions and inverse functions, and involves no numerical or algebraic calculations, but rather logic skills as applied to function notation. Students should be familiar with function and inverse notation.